Bathing in the River portrays ideas of balance and harmony. This limited edition print follows the classic style of MALO through the Piccaso like forms and the classic color combinations and lines. The energy of this piece will add a colorful touch to an office wall. Signed by the artist on the Bottom Right Front with the original certificate provided. Born in Bogotá, Colombia, Nico Amortegui, or "MALO", has lived and worked in the Southeast since arriving to the United States in 1996. Since age 15, Nico has been active in the fields of photography, design, and visual arts. A product of a large, close-knit family, Nico grew up surrounded by artists, learning carpentry, photography, interior design, and painting. Throughout his 20s, he focused on photography, traveling throughout the US to shoot for various modeling agencies, as well as surf and skate magazines. MALO resides in Charlotte, NC with his wife and two daughters. He now focuses on painting and sculpting and woodworking with found objects. 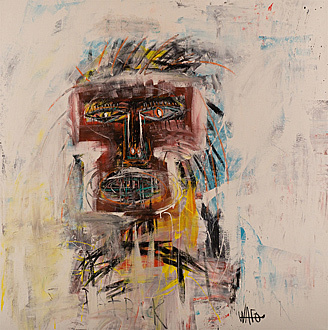 Mahlstedt Gallery is thrilled to be a part of his rapid rise to success. He has recently finished a public work soon to be installed in New Rochelle. He has also executed multiple public works in Washington D.C. and throughout North Carolina. He has had numerous exhibitions throughout the country, including shows in Atlanta, throughout North Carolina, and at Art Basel, Miami. 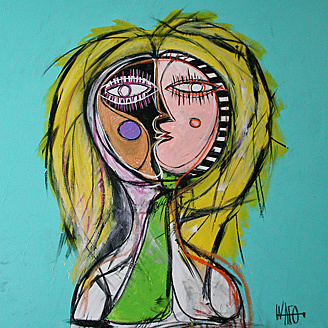 La Mona-Lisa by MALO is one of his less complex works of art. This limited edition print is an expressionist portrait inspired by the famous Mona Lisa; it is a colorful composition that shows a contemporary take on an old classic. This piece is composed in blue, yellow, and green, and will add interest to an office wall. 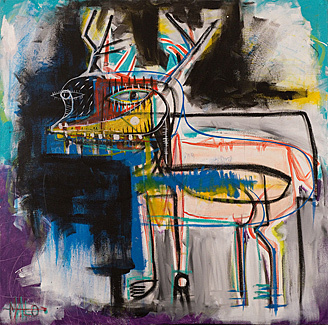 Deer by MALO is an original acrylic expressionist painting of a deer against a textured background of black, violet, and aqua tones. The energy and complexity of this piece will add a contemporary flare to any room. This original expressionist painting lends itself to the ideals of the abstract. This piece features a textured display of white, red, and dark tones to create the central portrait. Also available as a limited edition print, this affordable piece will add a contemporary flare to your home or office.